With the slogan "Control your E‑Motions", SANKEN has introduced several product innovations at PCIM 2016. Available for download at GLYN now. Now you can conveniently browse through the new product flyer. A total of 5 new components are available for different PFC solutions, including critical conduction mode, discontinuous conduction mode (interleaved) and continuous conduction mode. All components are designed for cost-effective SMD mounting and are available in SOP8 or SOIC8 packaging. The new NR2636S component is characterised by exceptional efficiency even at low load currents. The increased efficiency is achieved by "pulse skip mode". The component is available in SOP8 packaging. In addition to the normal PWM mode, the new STR5A450 series includes a green mode and burst oscillation mode. These modes automatically reduce the switching frequency to a minimum of 23 kHz. The components are available in DIP8 packaging. With an output current of 5 A at voltages of 40 V and 60 V, high-performance stepper motor drivers are now available to you. A particular highlight is the low on-resistances of the MOSFET H-bridges. The components are designed for the operation of bipolar stepper motors in 1/1, 1/2, 1/4 step and 1/8, 1/16 micro-step mode. Here there are optional inputs with clock-in and phase-in available. The driver is supplied in SOP36 packaging. 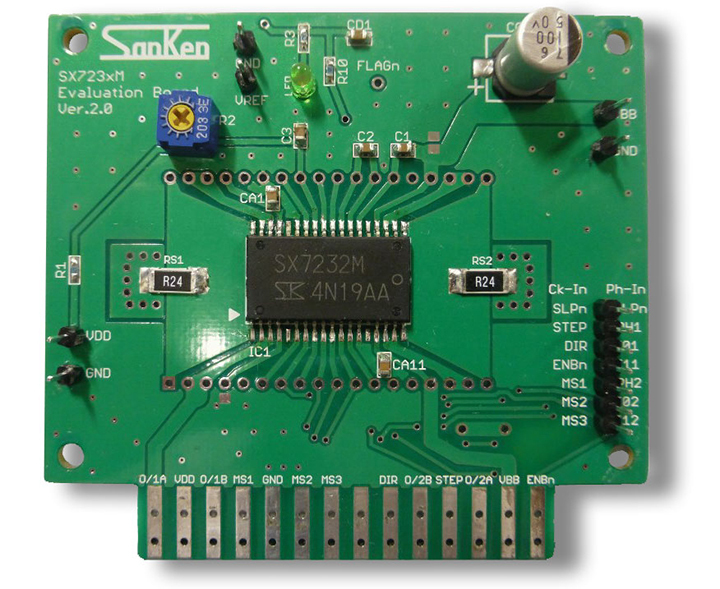 For a quick and easy entry, SANKEN is offering an evaluation board for the new components. We would be pleased to visit you together with SANKEN for a support meeting. Simply send us your topics and suggested appointment time.